I make promises to myself and I break those promises, but it’s alright, because I’m only making those promises to myself and in some cases I think it actually turns out better when I do break those promises, although I have no way of knowing how things would have turned out if I didn’t break them, so better than I imagined the promises would turn out. I’m used to broken promises whether by myself, or other people. It is hard to keep your word all the time, so I try and understand when someone promises something, but doesn’t deliver. I’ve learned not to expect people to understand my transgressions, but to understand others people’s. Even if it is to forget something truly important to me, I understand that they may not feel the same way. We cannot make people think the same way as us, although we do try our hardest to do so. I would prefer a world where people always kept their promises, but a perfect world, might make for an even more imperfect me and that wouldn’t do, since my imperfections are numerous already. 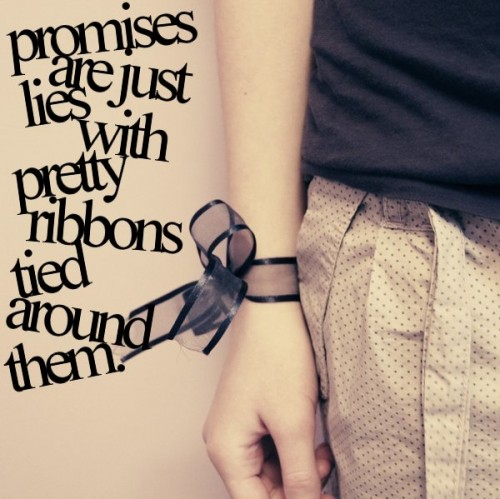 Promises are simply words, in which we use to convey meaning to the meaningless – or something like that. But in the end a promise isn’t binding, we do not have to remember or do. Although society wills us to do so and when you come across a person like me, who is willing to simply pretend to forget with you, it makes the guilt – if there even was any – evaporate completely. If the person you made the promise to doesn’t remember, it doesn’t matter that you forget, right? Because without the memory the promise does not in fact exists at all. But I didn’t forget, I only tried to spare feelings, so as to not place unwanted blame, for such reasons as I may ‘love’ you or have ‘loved’ you, or are in some way close enough to you, to not want harm placed upon you – or something along those lines any ways. Today was one of those sunny but cold days, which I actually sort of love about winter. Although sunny snow is something as well. There are certain stereotypical days that appear in certain seasons around the year that I really love. Although only in the right season – or so I would have myself believe. Nothing much out of the ordinary happened today, it was the usual progression of events, although Christmas is slowly getting closer and I’ve only got about 1 more present to buy and then I’m done on that front – yay and all that jazz. I’ve decided to write a short novel over the Christmas time and I think I know what I’m going to base the story around. Although I’m not sure I want to continued with my current theme of disaster and the horror of living a certain sort of lifestyle, although I want to do something on the mortality of the human and the human mind, although that might have to wait. But I’m going to start this one new and finish it maybe, hopefully by the new year, although I might not begin it until the end of the week or somewhere around then. I know that most people would argue against this, but I already sort of have a name in mind ‘The Unblinded’, although I might just tuck that one away for a raining day and come up with something else for this, but if I don’t finish it by the new year-ish time, I think I’ll probably be a bit crushed. I don’t really work amazingly under timed conditions, but I’ve got to get myself used to it any ways and I can do it in my breaks for all the revision I’m meant to be doing.